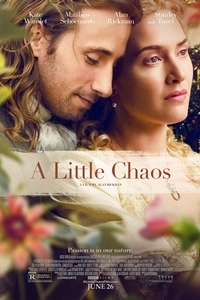 A Little Chaos tells the story of Sabine De Barra (Kate Winslet), who convinces Andre Le Notre (Matthias Schoenaerts) to let her design one element of King Louis XIV’s garden at Versailles, despite her devotion to the titular diminutive disorder. 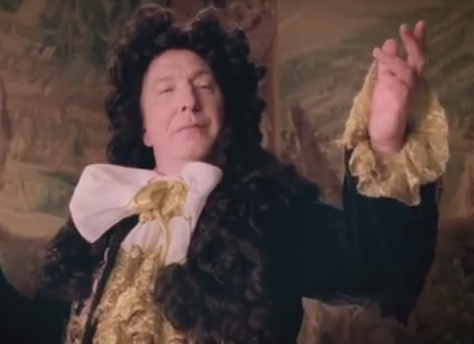 Besides directing, Rickman gives a fine performance as the monarch in question. Matthew Lickona: Is the King the secret star of this movie? Alan Rickman: No, I think it’s absolutely Kate’s story. The king gives it a context, and he’s so powerful that it’s a very strong context, because it’s a world where she’s the only woman who’s got a job. The others are standing around curtseying. In a way, that’s the point of the film, to take somebody like Kate’s character, who couldn’t possibly have existed, and inject that fantasy element into a representation of a real world that did exist — but one in which this one man was all-powerful, but slept alone. That was the thing about him, and I suppose that’s the point of the last images, this single figure with everybody dancing around him as two people who have figured out who they are go off into the forest. ML: What about this project grabbed you and made you say, “Yes, this one”? AR: Probably, I was going to say, certainly art or artistic pursuits, but maybe also in life, order and chaos have to kind of live together in order to make sense of each other. You don’t have chaos without knowing what order is. In a way, as ordered as Le Notre was, it’s having a chaotic element like Louis XIV that makes it possible. It’s a balancing act, I think, between the two. If I’m talking to young actors, I always find myself saying that discipline and freedom are two sides of the same coin, and it’s always a fight to get the two to somehow be together. ML: Tell me about forming your sensibility as a director out of your experience as an actor. AR: You get more and more aware of the circumstances you would wish to create. If you, as a director, can say, “I don’t know,” that actually makes actors feel confident in a director. Because you’re strong enough to say that: “I don’t know but we’ll get there.” And then to encourage actors to answer their own questions, so that you answer a question with, “What do you think?” It isn’t lazy; it’s helping an actor to commandeer the part. ML: I told my children, “I’m interviewing Alan Rickman,” and they said, “You mean Professor Snape?” And I wondered if you would make a suggestion to children who grew up watching you in the Harry Potter films: what’s a film that they should look at to either expand or work against — or just to see Alan Rickman outside of — the role of Professor Snape? AR: It would depend how old they were, and what they were allowed to watch. ML: Say a 16-year-old boy with a pretty free hand. AR: Well, he should certainly watch Dogma, and he should watch Galaxy Quest if he hasn’t already. That’s a genuinely funny film. And I’m just amazed by how much young people love Dogma. And there’s a little film I made with Sigourney Weaver called Snow Cake, about autism, that I love. Those three to get on with. June 25, 2015 @ 6:46 p.m.
Alan Rickman was the sarcastic sibilant Sheriff of Nottingham in some wonderful Robin Hood movie and he was, no pun intended, to die for in the British romance "Truly, Madly, Deeply" about love, loss and recovery. June 26, 2015 @ 1:04 p.m. Sorry to crash Matthew's party, but I just wanted to give Monaghan a heads-up. In spite of your oft-stated contempt for the venue, I do hope you get around to seeing "Manglehorn." You'll love it!